Designed and built to withstand the rigors of classroom use while providing high quality sound. Wirelessly stream music from your Bluetooth ready tablet, smart phone, computer or other Bluetooth enabled device! 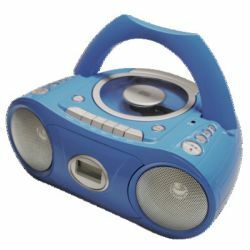 Also features a fully programmable CD player, cassette recorder, microphone input, FM radio, digital LCD display, and 2 full-range 3" speakers with 4W audio output. An exclusive set of six 1⁄8" headphone jacks located on the back make this unit the best choice for classroom listening center use. AC power or use 8 “C” batteries, not included. One-year warranty.